A non-peated Bruichladdich special, highlighting the local and traditional craftsmanship of the distillery. 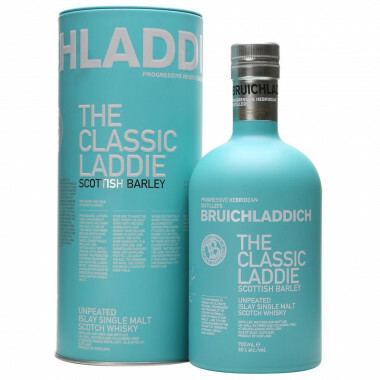 Bruichladdich The Classic Laddie Scottish Barley is an equivalent of Ladddie 10 but without any peat flavour. "Scottish Barley" highlights the local, traditional craftsmanship of Bruichladdich distillery, as the barley used for the malting comes from a single farm and single field. Created by Jim McEwan, distillery's Malt Master, to convey the floral and elegant style of Bruichladdich, this Single Malt aged slowly in oak casks laid in the coastal warehouses of the distillery, battered by and infused with the Atlantic seaspray. Established in 1881, this Islay distillery faces Bowmore on the other side of the Loch Indaal. A rare fact in Scotland, the Bruichladdich distillery (“Bruk-ladie”) uses a brewing vat in open air. Its onion-shaped stills have a very flat bottom and a long neck. The very light peated Bruichladdich Single Malt is unfairly underestimated. It reveals indeed a maritime origin with an iodized nose and a salty mouth flavour. Longer maturation imparts a full body to the whisky and makes it a gourmet, elegant malt. Bruichladdich is also perfect when aged in sherry casks. The distillery produces also two heavily peated whiskies: Port Charlotte and Octomore. Notes of iodine, a fruit basket full of tangerines and lemons, with an oaky freshness rising alongside typical barley flavours.